[Free Pattern] These Daisies Are Very Pretty And Cheerful! Square Pattern Included Too! Judith Beck Shared My newest completed Project: Trail of Tears Scarf. Thanks to Sandi’s Angels for this article inspiration and images. Got inspired? Happy day crocheting! [Free Pattern] Pretty Up Your Dish Drying Routine With This Lovely Tunisian Crochet Drying Mat! Very cute. However, I can’t find a link to any of the patterns. Mishka and Robyn, sorry for the trouble. I replaced the link as the site seems to not be available anymore. 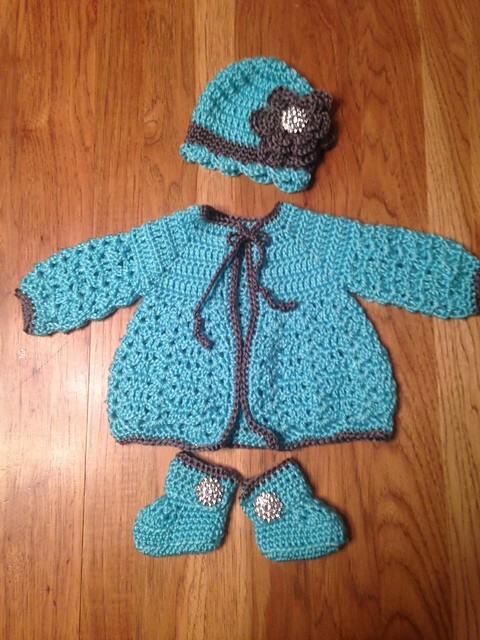 Please click the name of the pattern: Aunt Jen’s Sweater to get to the pattern’s page. It is SO hard to figure out how to get your patterns. Press this? No, it’s a Walmart ad! Ahhhhhhh! 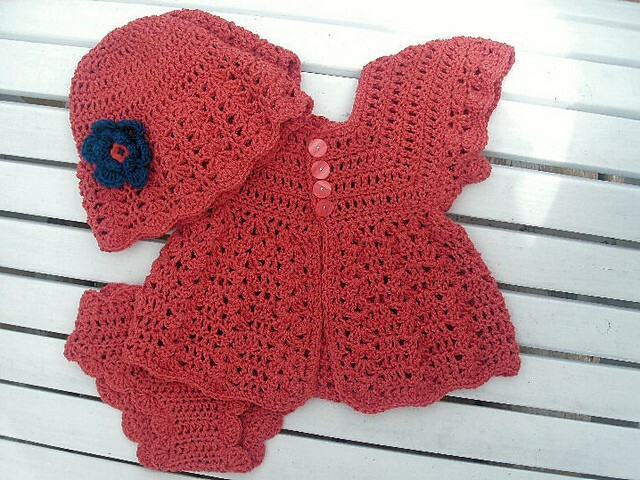 Zaneed Akhtar, please click the name of the pattern: Aunt Jen’s Sweater to get to the pattern’s page. I crocheted this for my baby 51 yrs ago, she still has it. 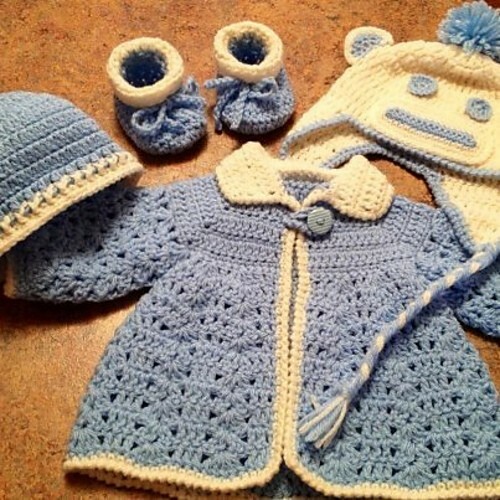 Really live the grey and yello sock monkey set, said free pattern but could not get the pattern, can you send it? Really love the grey and yellow sock monkey sweater set, says free pattern, could not find it, can you send it to me. Got 3 new babies coming between January and March. This would look nice with the quilts and quilted bibs my sister and I made. Debbie, the pattern is always linked to the name of the pattern. Please click the words: Aunt Jen’s Sweater to get to the pattern’s page. Also the word “here” in the phrase: “The booties pattern is written here. ” Hope this helps! So sorry to hear about Mrs. Jerry. She was such a sweet lady. Praying for her family. I cannot get this pattern to down load. Rose, the pattern is linked to the name of the pattern ( Aunt Jen’s Sweater ). 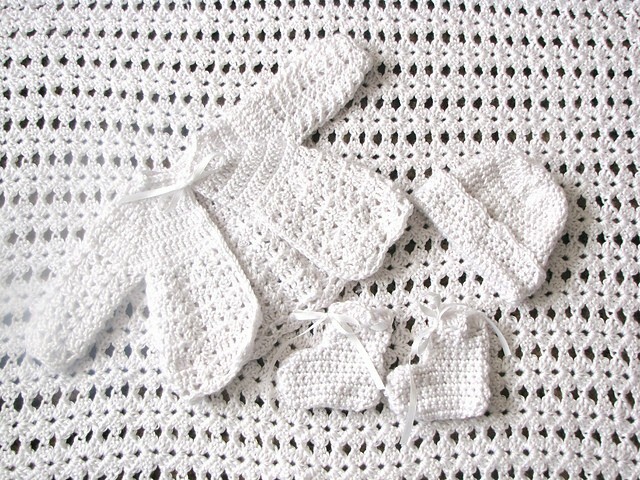 Please click that link to get to the pattern’s page.